"If you could list just one thing, what advice would you give to newlyweds about the first year of marriage?" HAHA- At first i hardly felt like i was experienced enough to answer this question...then realize she is asking specifically about the first year of marriage & not just marriage in general! 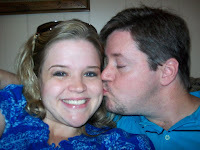 Hubby & i will celebrate our 1 year anniversary in less than a month (November 14th). I can't believe it! Man, time has flown! On one hand, i feel like we JUST got married. But on the other hand, i feel like we've been married forever. It's wierd. But very cool. Wonderful. We've laughed a lot about how great the first year of marriage has been. We were told over & over during our engagement "ohhhh, the first year is the hardest! If you can get through that, you can get through the rest of it!" & we'd laugh throughout the beginning of our marriage, like, "if this is the "hardest year" then we've got it pretty good!". Of course, at the time we were only like 3 or 4 months into it, so we couldn't really brag about it to anyone. But now, we're almost 12 months in & we still very much feel that way. This has been the BEST year. I mean, simply the BEST. We have truly enjoyed our time together. It honestly (& i am in no way exaggerating or stretching the truth here!) feels like a DREAM COME TRUE. We're best friends, we laugh all the time, we're seriously two peas in a pod!! I love being with him. There is never a time where i 'need my space' or anything like that. I mean, i'm not saying we have to be sitting side by side every waking moment. But i'm just saying i fully enjoy his company. Or maybe i should just say: COMMUNICATION! I mean, that's how the therapists say it. That's how preachers or counselors say it. They say that divorces are happening a lot in today's society because of lack of communication. In our language, though, i just say "talk about everything". And i mean- EVERYTHING. Ok, well, everything important. Even if it's just a little important. Even if you just feel like it's not important now, but maybe will be later. But especially those things that you'd rather sweep under the carpet. Like if he says something that hurts your feelings & you'd rather just not confront the issue. You'd rather just forget about it, forgive him this one little thing, or pretend it didn't happen. But i have learned this is not the way to go. You should just get everything out in the open now. Please understand that when i say this, i do not mean nitpick. I do not mean constantly nag & whine & pick apart everything he says. I just mean that if, on occasion, he says something - intentionally or not - that hurts you...go ahead & deal with it. And allow him to do the same with you. And by the way, when i say TALK...i also do not mean YELL. I do not mean FIGHT. I do not mean come at them screaming & cursing!! You would think that would be a given, but i'm always amazed at how many women talk to their husbands this way. I mean, this is supposed to be your best friend. I'm not talking about crazy situations like if you find out he's cheating on you, spending your entire salary on gambling or something like that! I'm just talking about your everday breakdown in communcation. Dirty looks & mean words is not really the way to approach this. I just mean CALMLY...and kindly...talk to him about it. Give him the benefit of the doubt. For us, it is almost ALWAYS just a simple misunderstanding. We actually learned this before we got married. For those of you who don't know, Brad & i were a couple long ago. He was my first serious boyfriend. We dated when i was 19 & he was 21. We were best friends then too. We loved each other then too. We had great chemistry then too. But we failed to TALK. He would say something that hurt my feelings & i'd ignore it. He would get mad at me about something but instead of talking to me about it, he'd just let it bottle up inside of him until he exploded at me (which was a huge problem because i had no idea i had been doing anything wrong!). I don't know why we didn't talk things through. We were both serious about each other, in love & all that, wanting to get married. I know part of it was immaturity. We obviously didn't know the necessity of talking about everything. It was easier to forget about it & move on. But then- he wouldn't know that something hurt my feelings & would do it again. Or i wouldn't know that an action of mine was driving him crazy so i'd continue to do it, simply because i didn't know. We broke up in January of 1998, after 13 months together. In December of 2008 - he contacted me. After all those years- i'd only seen him a handful of times (by accident) in the 10 years between! And so, after his call in 2008, we went out on a couple of dates. But we both just didn't think it was going to work out. Then we started emailing each other. And we got out all kinds of issues from our relationship all those years ago! And that is when we realized that a whole lot of our trouble was just ONE BIG MISUNDERSTANDING! It was crazy! And you can't fully know the extent of what i mean, but i'm talking some serious things that he thought that simply weren't true! & things i thought he'd said that i somehow misunderstood. By the time this period of emailing each other back & forth was over, i knew he was THE ONE. i couldn't believe it! I'd moved on long ago, never imagining that he could still be the one. But he was. We got back together & were engaged pretty quickly. But we knew this time it would be different- because we knew that we simply had to communicate! A happy marriage depended on it! And so we do. And we've had to talk about some serious things. Especially during our engagement! Things i didn't understand. Things he didn't understand. I mean, just getting to know each other. Meeting the one & falling in love is GREAT- but you're going to LIVE with this person. You're going to know everything about them! Your lives will merge. And no matter how much love you have for each other- there WILL be things you just will disagree on. It's just a part of marriage- coming from two different families, two different backgrounds. We learned that we HAD to talk things out, and we began to put that into practice right away. And we still do this now. Even this past week, he emailed me something that really upset me & offended me. I called him on it. I really didn't want to. Everything was just fine, what was my problem. I thought, "Oh, Melissa, what is your problem? He didn't mean anything by it!" & i wanted to forget about it. But i couldn't. I was really upset. I was angry. i couldn't believe he would say that. So i made myself talk to him about it. And, he totally didn't mean it that way. I mean, guys & girls are so different. We can hurt each other's feelings unintentionally. Ignoring it doesn't help things. You'll end up resenting him for no reason at all! Great advice!!! I think a lot of what you said can also be applied to friendships... just get things in the open and talk them out. Misunderstandings ruin way too many good relationships. I never get tired of hearing about your story!!! Thanks! & i agree- definitely can be applied to friendships too! Great advice. I completely agree! I have been married for a little over a year and while it is a lot of work to maintain a healthy relationship it is 110% worth it! I found you through Laura, I can't wait to read more! This is the sweetest thing ever... My boyfriend and I have been dating for more than six years. I feel like we're married already. Once we say our I Do's, though, I'm afraid that things may change. Your story has given me a little hope, though!! Aw, i'm glad! 6 years! Wow, that's a long time! We haven't been together that long! But i know we will be just as happy then!! he's the best! That is great advice, too, Lindsay! I'm reading a book now about this couple that both didn't want kids when they got married & he has a change of heart- & they get a divorce over it! I'm like...can't you work this out?!!? (Of course i'm sure they do- it's a novel & i'm only halfway through!) But that advice would be perfect for them- don't let an issue be more important than the person! MAN! Love ya too! & yeah- you really should start a blog! !